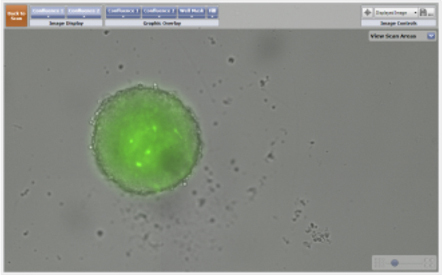 The Celigo imaging cytometer has been developed to fully automate imaging and analysis of multicellular tumor spheroids (MCTS). This automated morphometric analysis tool significantly reduces the time and effort needed to quantify key aspects of 3D spheres including size, growth, growth tracking over time, and response to chemotherapeutics. 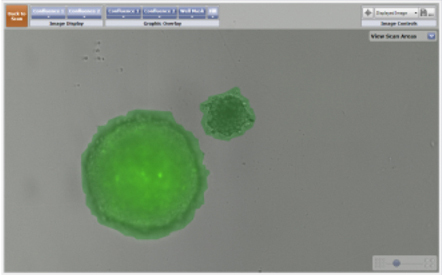 Additionally, the Celigo software can determine the confluence ratio between two objects, providing an analysis measurement for researchers performing 3D confrontation assays. The series of images below were taken over a 24 hour period to monitor confrontation between two 3D spheroids. 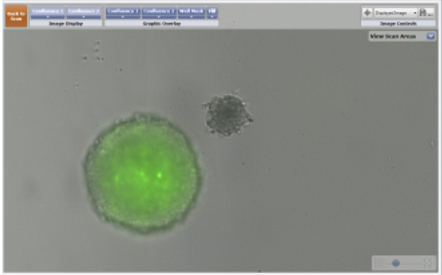 The images on the left are of a GFP-labeled 3D multicellular tumor spheroid and a bright field image of a 3D astrocyte. The images on the right display the identification of both the 3D spheroid and the astrocyte using the Celigo confluence ratio algorithm. The identified objects are outlined with a green pseudocolor for easy identification. 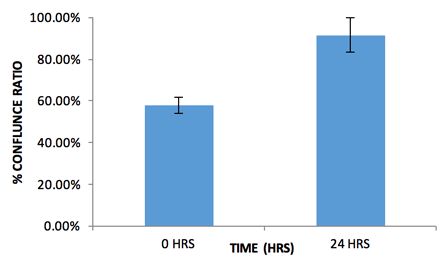 The confluence ratio application calculates the ratio of the GFP confluence area that is within the confluence area of the bright field channel. 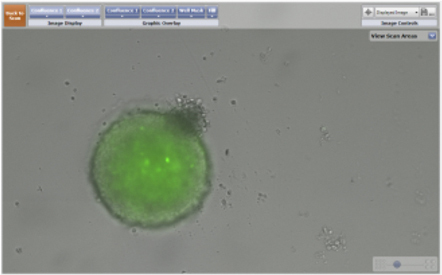 In this case, the GFP signal from the 3D multicellular tumor spheroid occupies about 60% of the total measured bright field area (tumor spheroid + astrocyte). Over a 24-hour period, as the two spheroids merge, the total bright field area shrinks and the percent confluence ratio increases. 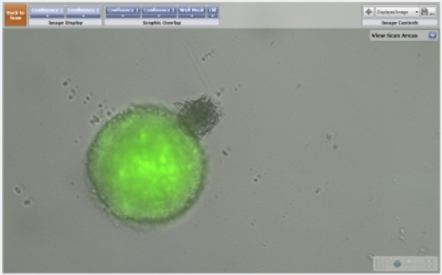 Similarly to the confrontation assay using a 3D astocyte, the Celigo was used to image the confrontation between a GFP-labeled MCTS and an EB over a 55-hour period.